Everyone has particular sightings they dream of when they head out on safari, and I can assure you that no matter how many safaris you do, if you love it as much as I love it, you never stop dreaming. Sometimes my dreams are simple for example ‘ I would love to see a pangolin’ (haha) and sometimes more complicated, say ‘ I would love to witness a birth’. And there is no better time to try for the latter dream than during the calving season in the Serengeti, where a couple of million wildebeest and a few hundred thousand zebra all congregate on the open plains to give birth together. When you're brand new, and have zero control over your legs! One of the reasons for this mass-birthing behaviour, is that there is a lot of relative safety to be gained by all dropping calves at the same time. While there will always be predators, hungry and on the prowl, if you flood the market with babies, supply exceeds demand and you have a higher proportionate chance of surviving your first weeks as a baby zebra or wildebeest. It’s a numbers game, this game of life and death, which plays out annually on the beautiful and vast Serengeti plains. For a newly born zebra, this is just the beginning of an annual migration which will place him in the path of danger many times. I love zebra, there isn’t much not to love. For starters, they look like stripy horses. In fact I’m fairly certain the Swahili word for zebra, punda milia, means stripy donkey. Isn’t that delightful? And they are beautiful, especially when seen in huge herds, where their patterns flow into one another, forming a sea of stripes and movement. The collective noun for zebra is ‘dazzle’, a perfect way to illustrate what it looks like when a large herd of them move at speed away from a predator. Heading out one morning in the Serengeti, with my guide and good friend Waziri (AndBeyond East Africa head ranger, who had helped put together this trip, and guided me privately throughout - he is excellent!) 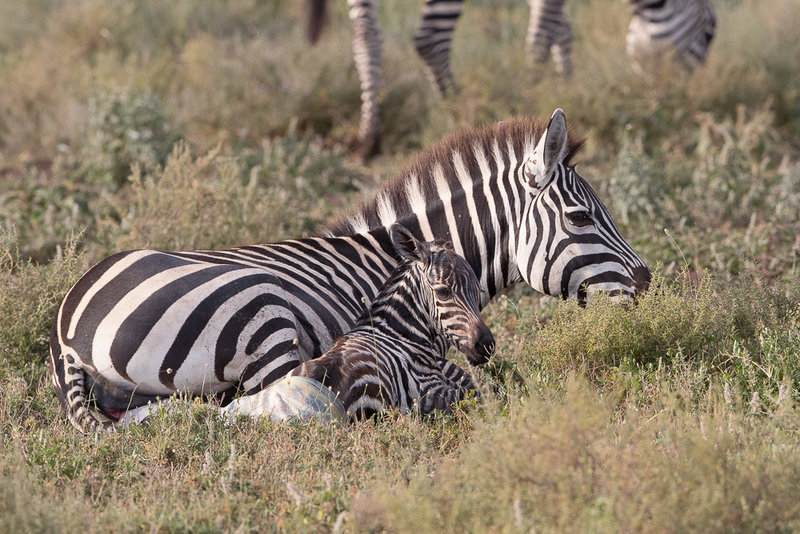 we stumbled upon a zebra lying down in the middle of a small herd. Zebra do this sometimes, so its easy not to pay much attention, but fortunately we did, as she had just started the process of giving birth! We watched, in awe, for over an hour as the little calf slowly slid out, and raised its head for the first time ever, blinking at the world around: a sea of grass and endless sky. It was tiny and wet, its fur not yet fluffy from exposure to the elements, which made it look even more stripy than your usual zebra calf. Given the helpless state us humans are born in, we can’t fully imagine what it’s like to view the world for the first time, and actually have to take in everything around us. To spend those first hours memorising your mothers stripes and scent so you can find her in the herd. Then there is learning to stand, something which it is vital for a zebra to master within the first few hours, and it never knows when it may be faced with the first predator. This little guy, who I nicknamed Harry (he looks like a Harry, and as I’ve said before, I can’t help but anthropomorphise animals) took 7 minutes and 4 seconds to stand up for the first time. Of course he promptly fell down, hoof over head, and then spent the next 30 minutes mastering the trick of standing on spindly, out-of-control legs! Harry’s mom didn’t help matters much, by gently nudging him over each time he stood, but I’m sure it was to give him extra experience in the art of standing, and to strengthen those as yet unused muscles. This sighting was incredibly special, and after an hour or so, the calf had managed his first drink of milk, and was becoming ever more confident on his legs, and receiving much attention from the other members of the herd. His mother was back to grazing, keeping a watchful eye on her calf and making sure he never got more than a metre from her side. And we left to enjoy a breakfast of muesli, fruit and eggs overlooking the endless plains, stretching as far as the eye could see. 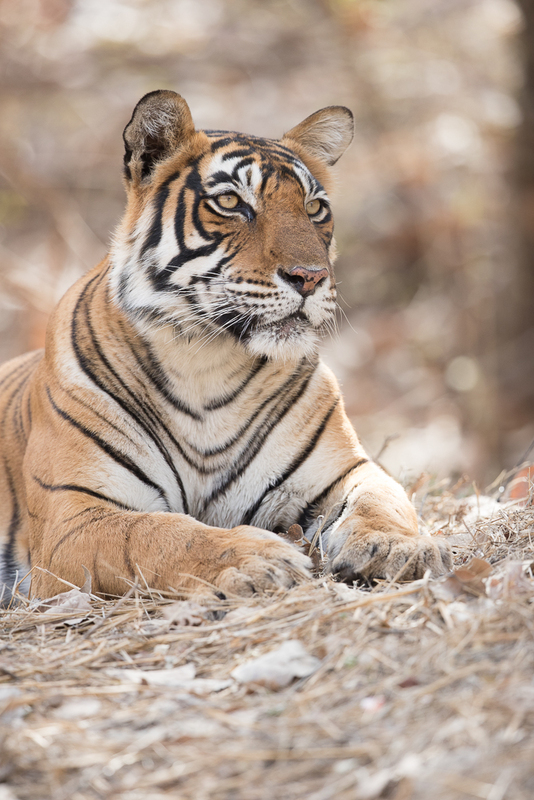 A year ago, with great excitement and a little trepidation, I set off on my first trip to India, more specifically to Ranthambhore, with high hopes of getting a few images of the beautiful and endangered Bengal tiger. I was not disappointed. If anything, I was surprised at how many photographic opportunities I had with these cats. My first drive in the dry and dusty April conditions produced no tigers, but my second produced an excellent sighting of the well known Tigress, Noor, and the first picture I ever took of a tiger! I was essentially speechless, and those who know me know it takes a lot to make the words stop. Not only did Noor pose beautifully, she also led us to her cubs, who were around a year or so old at the time. They lay in a natural spring together, and played, with one cub reluctant to get its paws wet, and the other a comfortable bather. I still remember this sighting as if it was yesterday, along with the emotions that accompanied it. This year I noticed that the path to the spring had been closed off, which means it’s unlikely I will ever get an image like this again. The cub, attempting to avoid wet paws! This year, I entered zone 2 anticipating a lot more of Noor. As it happened, I only saw her once on the trip, but I did get a few wonderful sightings of her grown cubs, who are now independent and massive! We spent one full afternoon in the presence of Noor’s male cub as he relaxed in the shade near a waterhole, blatantly ignoring the many vehicles who crowded around to see him. (As a point of interest, this is one of the worst parts of a visit to India: the vehicle numbers and the manner in which many of them conduct themselves. It’s not worth going in to too much detail, as there are many reasons for this - most notably I imagine is the expectation that everyone needs to see a tiger or they won’t tip (and the guides and drivers are paid very little by the park, so rely on tips). That said, you can have a magical sighting to yourself, of which I had a few. You can also have a guide who knows the tigers and their behaviour well, and can predict where to drive, park and wait, and when to just watch and listen. I had guides like this, specifically chosen on both of my trips, and I promise it has a huge influence on the quality of your Ranthambhore experience. Don't let the vehicle numbers put you off a visit. This park is spectacular, and the tiger viewing can be out of this world. To see these endangered cats roaming wild and free in the rocky landscape is something you can't put a price on!). Tigers have an uncanny ability to act as though you don’t exist, ignoring the shouts and arguments which break out between vehicles. They rest very easily, knowing they reign supreme in their environment, with no real natural predators. Most of the African cats remain wary when resting, ever alert to sounds which could signal the arrival of a threat. Tigers sleep as though dead. This gives you a good opportunity to listen to their heavy breathing and admire the sheer size of their paws as they roll around, presumably enjoying dreams of chasing sambal and chittal. For our last morning in the park, we were assigned zone 1, and after half an hour of driving we came across a very dead blue bull antelope. He had clearly died of natural causes, in a small gully right next to the road. We drove a bit further, observing a number of tracks in the road, but no tiger. Not one to give up, Suri suggested we check another waterhole before coming back to follow up on the tiger we knew must be around. It turned out to be a very good decision, when as a result of the decision I saw my first Indian leopard! It wasn’t as relaxed as some of the cats I’ve photographed, but it was new… and then when we returned we found another of Noor’s cubs, a female, tucking in to the antelope kill in some beautiful early morning light. The kind of light that makes a tigers eyes burn with fire. Not a bad way to spend the last morning in the park, a park which is fast becoming one of my favourite places on earth to visit! Have a look at the power in this young female’s muscles as she tries to drag the huge antelope to some shade. A blue bull can easily weigh 200kg, and this female tiger is likely around half that, so she is pretty powerful. If there is one tigress who stands out from my latest trip to Ranthambhore in India, it’s Arrowhead. Aside from being beautiful, (but let’s face it, that’s not a unique feature as all tigers are magnificent) she is also very photogenic and relaxed when in the company of only a few vehicles. She put on a real show for me this year, so I’ve done what comes naturally to human nature, and claimed some kind of special relationship with her, a wild animal. My first sighting of Arrowhead was in zone 3, and came at the end of 3 hours of sitting in the baking 40 degrees sun, searching for tigers. My guide, Suri, had noticed a complete absence of spotted deer in the vicinity of the large lake (a standout feature of the landscape in zone 3) which she put down to the presence of a tiger as yet out of sight. After 1.5 hours and no movement, we drove off to check a few waterholes for any signs of life, and on finding none we made one last turn past the lake. As we pulled up, a hundred or so spotted deer took to flight, racing away from the tall grasses fringing the lake and splitting into 2 groups. ‘Tiger, Tiger, Tiger!’, the Ranthambhore catch-phrase assigned to the first glimpse of any striped cat. Out she flew, in hot pursuit, and eventually cornered one unfortunate deer in the shallow water. I sat open-mouthed in shock, not performing any particularly useful function as adrenalin coursed through my veins. Once Arrowhead had a grip on the deer’s neck, we raced around to the side of the lake and a better position, and photographed her as she finished off the job, and panting, dragged her prize toward the long grass. How cliched to compare it to a wildlife documentary, but that’s what it felt like as we told and retold the story to one another in excited whispers. The privilege of a small window into the life of this beautiful cat is priceless, and an added bonus was that we enjoyed most of the sighting completely alone, something rare in Ranthambhore! Barely 24 hours later we again found Arrowhead relaxing at a waterhole in zone 4. And 24 hours after that, she was wandering down the main road to the Fort. And 24 hours after that? It’s early morning and then sun has not yet risen. Our vehicle has just descended the steep road into zone 2, and we’re driving past some banyan trees when Suri's eagle eyes spot a tiger standing perfectly still on the road under an archway of trees. We back up, and see Arrowhead, head intently cocked toward a herd of deer who are grazing peacefully in the relative pre-sunrise cool. We park off and wait, as she slowly begins to move silently toward a ridge which provides the perfect cover for her approach. Within 15 minutes, the herd has moved far too close for their own own good, oblivious to the waiting tigress. With an explosion of power she clears the ridge and charges at the herd. One fawn breaks away, essentially sealing its fate, and the skilled huntress wastes no time in claiming her prize. Is watching death easy? No. Do I wish I hadn’t witnessed these 2 kills? No. This is nature; raw, sad, exhilarating. All I can do is document it as best as I can. On our final afternoon in the park, we again saw Arrowhead, cooling off in a waterhole in zone 4. That’s 5 sightings in 6 days of this cat, spread across her whole territory. Boy can she move around! I’m not sure how to explain what photographing a wild tiger feels like, as I have serious doubt in my ability to do the explanation any justice. These cats are magnificent - they have the richly coloured and patterned coat that's equal in beauty to a leopard's coat, yet are even bigger than a lion. It’s a powerful combination - they blend in perfectly to their environment, melting away into the trees at a moments notice. They can run for around 3 minutes in a chase, which is incredible considering the muscular bulk they are moving around. And their eyes burn like fire in the sunlight, leaving an impression on you which you won’t soon forget. My Indian wildlife gallery has more images from Ranthambhore if you are interested. I have a lot to thank my amazing guide, Suraj Meena, for. She did an excellent job of both finding tigers, and getting me into prime positions for photographing them, as well as adding a wonderful dose of humour and fun into the long, hot hours of searching and waiting. Patience pays off, and without her and her guiding skills and attitude I would never have enjoyed the trip or had as much success with photography as I did. She is also the only female guide in a very male dominated field. I cannot recommend her highly enough, but more on that to follow.